Despite what difficult procedures you may have endured to get to the U.S., including visa troubles, airport security screenings, and the like, the United States is a rather relaxed place once you arrive. But we do have a few rules that foreign visitors may not know about. Following are basic tips about traveling in the USA. 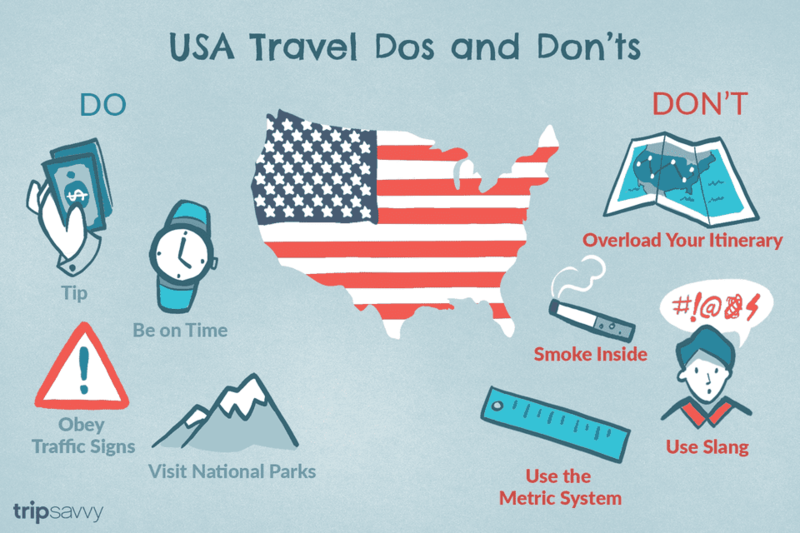 The continental United States is larger than Europe, so the most important advice I can give foreign travelers to the United States is: don't try to see and do too much. Many foreign visitors to the United States try to see New York, Washington, DC, Miami, and Los Angeles all in one trip. That kind of touring can leave a traveler very tired if you have limited vacation days, and it can contribute to sensory overload. The best way to see the United Stats is to focus on a region and travel more deeply. Many first-time travelers opt to do an itinerary of East Coast destinations like New York City and Washington, DC, while others may want to focus on a few West Coast destinations, such as Los Angeles, San Francisco, and Las Vegas. Other regions for consideration include the Southeast, the Southwest, the Northwest, and the Midwest . Tipping is customary in the United States and tips make up a large percentage of some service employees' salaries, particularly servers at restaurants whose average wage can range from $2.13 per hour to $7.25 per hour depending on state guidelines. It’s rude to walk out of a restaurant without tipping here so make sure you tip. You can tip anywhere between 10 percent to 20 percent but use this handy guide to tipping to figure out where and when to tip on your travels. "Island time" and other fluid concepts of time do not go over well in the United States. If someone in the United States tells you to meet them 8 p.m., you should meet them at 8 p.m. or arrive a few minutes early. Americans take punctuality very seriously and it is considered rude to be late. Give yourself more time than you think you'll need to get someplace, especially if you're not familiar with the area as unexpected delays can happen, such as heavy traffic. Unlike what you may have heard in some Hollywood films, Americans take your speech seriously and may feel insulted if you use certain curse or derogatory words associated with specific races and ethnic groups. Be sensitive, aware of your surroundings, and try to use the vocabulary they use in their everyday lives, for example, “How are you” instead of “How are y’all?” unless you have heard it used regularly in the region where you're traveling. The Southern states have different vocabulary for certain words so take note of them in this easy Southern word guide but use them with care. Read travel writer Sean McLachlan's "The N-word, the G-word and the Hidden Perils of Travel" for a little more perspective. Traveling outside of the United States, I have noticed that stop lights and "No Parking" signs in some parts of the world are mere suggestions for drivers. Not in America. Traffic and parking laws are well-enforced in most jurisdictions in the United States. For example, drivers must come to a full stop at a red light and remain stopped until the light turns green; drivers should obey the speed limit; etc. That said, states and municipalities devise the traffic and parking codes so check out the traffic laws of the jurisdiction you will be visiting if you plan to drive a vehicle. Also note that Americans drive on the right side of the road, which is the opposite of some places such as the UK and Australia. For many, one of the hardest parts about being in the US comes down to its lack of use of the metric system. You can kiss your Celsius degrees, kilometers, and kilograms goodbye for Fahrenheit, miles, and pounds instead. Whilst this might confuse you when it comes to finding out the weather in Seattle or Tulsa, this calculator helps you decode everything hard about it. Most tourists flock immediately to fan-favorites like NYC, LA, San Francisco, and Washington D.C for all the glitz and sensation. However, America’s national parks boast unique mammal species only found in Northern America, like grizzly bears, and beautiful sceneries worth long selfie-moments. From the longest cave system in the world at Kentucky’s Mammoth Cave to Alaska’s picturesque Denali National Park, you have 84 million acres of choices that are hard to find anywhere else. The unwritten rule of travel anywhere in the world is the Golden Rule: "Do unto others as you would have them do unto you." While traveling in the United States, DO be sure to smile, ask questions, say "please" and "thank you," and be patient. In almost all cases, your kindness will be rewarded by locals who want to show you the best of their cities and towns.